Data product generation is the last step of a process made up of several phases, which imply multiple validation steps through a commonly agreed and standardized Quality Control (QC) loop. 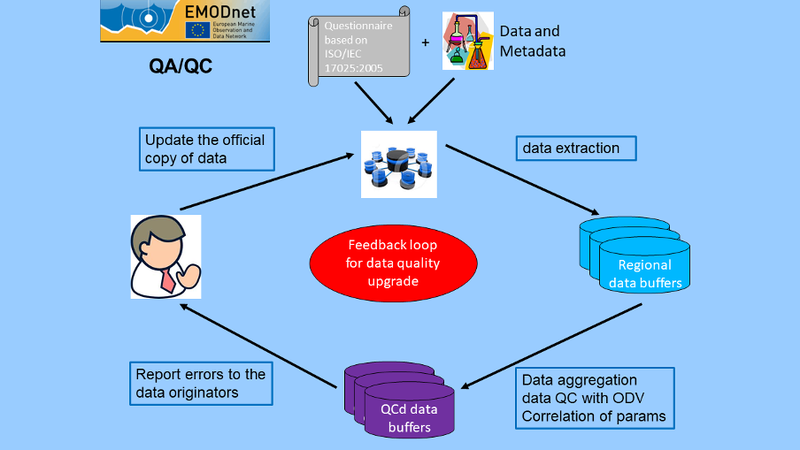 Within EMODnet Chemistry, commonly agreed and standardized data QC protocols have been defined to guarantee consistency among comprehensive databases, which include data from different sources, periods and geographic areas. As a result, regional harmonized and validated data collections (buffers) are archived with a quality flag that provides information about data reliability. Regional buffers are used to generate two different kinds of visualization products: climatological maps and dynamic plots. For selected groups of parameters gathered by EMODnet Chemistry, the distribution of sampling stations provides access to dynamic plots (time series or vertical profiles), that are automatically generated from the data available in the regional validated data collections, by a service based on Web Processing Service (WPS) OGC standard, and can be dynamically customized. The data products, both DIVA basin maps and the validated data collections, are ingested in dedicated viewing service (OceanBrowser), available at Products Viewer and Access Service. Hence users can browse for and visualise selected parameters maps at basin scales of observation densities, (animated) maps of temporal and spatial evolution (also in depth) and plots of temporal and depth variability of monitoring points. Both the generated interpolated maps and the harmonized validated data collections are published in the Data products catalogue, where also detailed descriptions can be found.